Don't be turned off by the "Vegan" in the name if you aren't a vegan -- the food at Green Leaves is delicious and they have plenty of great gluten free options. My roommate and I just had brunch at Green Leaves Vegan and were very satisfied. Neither of us could remember how we heard of it, but both of us were glad we did. It's on Hillhurst Avenue in the "trendy" Los Feliz neighborhood of Los Angeles and serves great gluten free pancakes all day! I ordered the banana & blueberry pancakes with organic maple syrup and was definitely not disappointed. I don't even remember the last time I was able to order pancakes off of a menu -- it was probably at Peters' Restaurant on New York's Upper East Side. 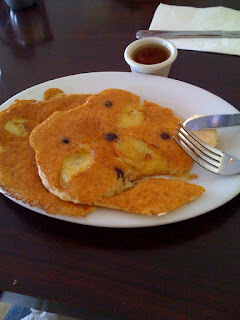 Green Leaves was great -- a very relaxed place with good service and great gluten free pancakes. My roommate agreed that they were some of the best vegan pancakes she's ever had. While I'm not a vegan, I normally don't eat meat in my pancakes (do you?!) and didn't notice any difference in the taste. Indeed, they tasted just the way I remember gluten-filled pancakes tasting. Be careful at Green Leaves. Their pancakes and many other dishes are listed as "gluten-free" but they use kamut flour, which is NOT GF. I actually think that it's unbelievably irresponsible and uncool of them to list their dishes as gluten-free when they just plain aren't. To put it simply, kamut is wheat. I had no problem eating the pancakes and did not feel any side effects. I will check on the ingredients next time I eat at Green Leaves. "-Spelt or spelta and Kamut are wheats. They have proteins toxic to celiac patients and should be avoided just as bread wheat, durum wheat, rye, barley, and triticale should be avoided. -Rice and corn (maize) are not toxic to celiac patients. -Certain cereal grains, such as various millets, sorghum, teff, ragi, and Jobs tears are close enough in their genetic relationship to corn to make it likely that these grains are safe for celiac patients to eat. However, significant scientific studies have not been carried out for these latter grains. -There is no reason for celiac patients to avoid plant foods that are very distantly related to wheat. These include buckwheat, quinoa, amaranth, and rapeseed oil (canola). Some celiac patients might suffer allergies or other adverse reactions to these grains or foodstuffs made from them, but there is currently no scientific basis for saying that these allergies or adverse reactions have anything to do with celiac disease. A celiac patient may have an allergy to milk, but that does not mean that all celiac patients will have an adverse reaction to milk. Again, however, scientific studies are absent or minimal for these dicots." Thanks for the comment. I'll check on the ingredients next time I'm there; I didn't feel any side effects after eating the pancakes. I updated the post to reflect your warning. I am gluten intolerant and also have celiacs. I was very excited to find green leaves and asked if the items I wanted were gluten free which they said that they were. I have repeatedly gone back and tried many of their menu items, and consistently have reactions to their food. I know, why do I go back? Because its tasty, and I re-asked and they assured me that it is gluten free. I thought I might be reacting from something else as reactions can be delayed. I have had their noodles, sweet n sour sauce, and eggz rolls and at least one of those is not gluten free, judging by my reactions. That is really not cool.